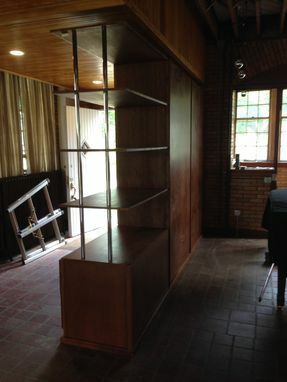 As part of the remodeling of an abandoned firehouse into their home, a couple requested an open-ended storage cabinet; the cabinet must have several permanent shelves supported by chrome poles. 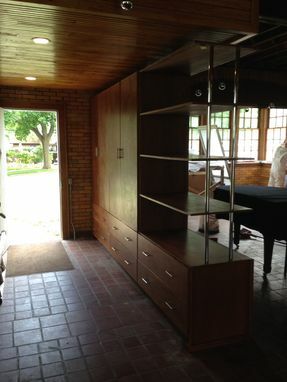 Two large drawers for storage also move smoothly on full extension, ball bearing drawer slides; polished silver drawer pulls are used to match other cabinetry in the remodeled firehouse. This open-ended cabinet is attached to 2 tall storage cabinets to effectively make a grand entry way into the firehouse.